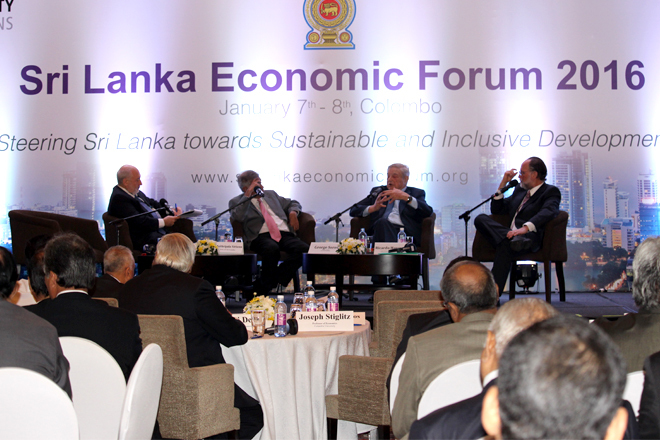 Jan 08, 2016 (LBO) – Renowned economist Joseph Stiglitz, speaking at the Sri Lanka Economic Forum, explained some of the ways the government could raise tax revenue by taxing environmental pollution, inelastic goods, land, consumption and road congestion. “What is the best way to increase tax revenue?” the nobel laureate asked a packed forum of government and private sector officials at forum in Colombo. He said there are several principles of taxation, one of which is to to tax bads over goods such as environmental pollution. Carbon taxes help to address the problem of emitters of greenhouse gases not facing the full social cost of their actions. Taxing inelastic goods, was another way to raise tax revenue that leads to less distortions, he said. A third possibility is land taxation which requires having a national land registry, Stiglitz said. Analysts say some instinctively react negatively to land tax proposals, and they have been controversial in countries such as the United States where they are used. Those arguing for land value taxation say it is a tax difficult for the rich to avoid, promotes more productive use of capital, and provides a stable revenue source, especially for local government. Those arguing against land value taxation say it is a tax on unrealized capital gains, which could unfairly affect retirees or elderly who do not have a commensurate income stream. Some taxpayers will fear reappraisal and unfair reappraisals. Outlining other methods, Stiglitz explained how taxation on consumption of luxury goods can help in situations of balance of payments problems. Road and congestion taxes, when coupled especially with modern technology, could allow tracking of vehicles and taxing the externality of congestion, Stiglitz added. Economists at the forum added that widening the tax base was more important than the rate in improving tax revenues, with Sri Lanka’s tax revenues falling below levels of comparable countries over the last several years.